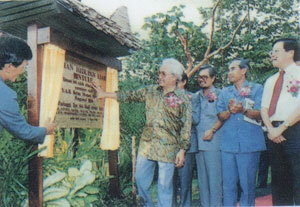 Taman Tumbina Bintulu was established in late 1990 by the Bintulu Development Authority (BDA), a statutory body of the Sarawak State Government. It was officially opened to the public 2nd August 1991. Tumbina is situated at the Tanjong Batu Recreational Area, about 5 km from the Bintulu town centre. The area is about 57 hectares and was declared a Special Area under the Public Parks And Greens Ordinance, 1993 on the 17th June 1993.